Digital Disruption describes the radical change of markets and business models through digitalization. It is closely related to the term Disruptive Innovation, a term shaped by US scientist Clayton M. Christensen. There is a difference between digital transformation and digital disruption: digital disruption refers to the radical change and even dissolution of traditional business processes and models, while digital transformation describes a rather continuous process of change. Digital Disruption goes beyond the conventional understanding of innovation. New forms of value creation, new digital business models and new markets are emerging. The difference between digital transformation and disruption is illustrated using three examples. These examples are not hypothetical. Start-ups are already working on implementing these models. However, they have not yet reached a mass market. These three examples show how traditional markets will change in the coming years. Imagine you have a doctor’s appointment. Your doctor agrees to arrange an online consultation with you. It’s digital transformation. The doctor changes neither his activity nor is he implementing a business innovation. The process of service delivery (consultation of the patient) is also changed only insignificantly: The Skype consultation hour is what used to be the short telephone call. The doctor uses the possibilities of digitalization, but otherwise nothing changes. Digital Disruption means that parts of the medical expertise will be replaced by algorithms. There are already numerous examples here: For example, the digital sleep laboratory, an app with which patients can monitor their sleep quality. In analogous times, patients had to visit a real sleep laboratory. Digital transformation in the insurance industry means that patients can submit their medical bills via an app. Take a picture of the receipt, upload it, and you’ re done. This has a number of advantages for the customer, such as saving time and effort. However, this is not digital disruption. The term “disruption” is used only when entire parts of the previous processing are replaced by artificial intelligence. Zurich Insurance, for example, has calculated that the use of artificial intelligence dramatically reduces processing costs. While a clerk needs forty minutes to process a file, artificial intelligence does this in five seconds. In the field of mobility and logistics, digital transformation means equipping vehicles with GPS devices in order to be able to locate the location at any time. However, the procedures and work processes remain the same. Digital Disruption means that the same technologies are used to allow trucks, buses and trains to drive autonomously. The determination of a location in real time is one of the essential prerequisites for the operation of autonomous systems. In order to address digital disruption, it is not enough for companies to establish an innovation management system. They need to increase their innovation capability to be able to manage disruptive innovation and radical innovation. This requires establishing an innovation culture and using state-of-the-art innovation techniques such as Innovation Labs or Open Innovation. Digital Disruption aims to replace human activities through automated processes. Whether in production, customer service or sales: the use of algorithms increases the efficiency and reliability of processes and procedures. The downside: companies will need fewer employees in the future to achieve drastic productivity gains. It is not certain whether this will in any case mean mass redundancies, as has been shown in numerous studies. Digital Disruption changes activities, partially replaces them, but at the same time creates new opportunities. Take a simple example – your toothbrush. Your toothbrush is a typical example of an analogue product. It was produced with a promise that your teeth will be clean. Whether they really are is your problem. Not the manufacturer’s. Digital disruption is changing that. A toothbrush equipped with digital motion sensors and connected to an app via Bluetooth records your brushing behavior. The brush shows you whether you have really brushed your teeth thoroughly. With the help of the data, you will later have an overview of whether you have cleaned regularly and well. Your dentist will make it easier for you to make a diagnosis and you may receive discounts on future insurance if you have positive data. Thanks to the additional digital services, the toothbrush is no longer a mass-produced product, but one that adapts to you individually. This, too, is digital disruption: mass analog products are becoming individual digital products. Digital disruption often means the dissolution of rigid corporate structures and the relocation of work to the crowd. This principle has essentially emerged from the duel between Brockhaus and Wikipedia. The leading publisher of encyclopedias capitulated against an encyclopedia built by people all over the world. The underlying principle of digital disruption can now be found in a number of digital business models worldwide. Digital Disruption needs different management approaches than digital transformation. It requires a digital roadmap. Digital transformation is comparable to incremental innovation. In recent years, companies have managed both innovation types through a number of different measures: from the establishment of a continuous improvement process or idea management and innovation management, the definition of innovation processes to the establishment of an innovation culture. This is the basis of the innovation capability of companies. 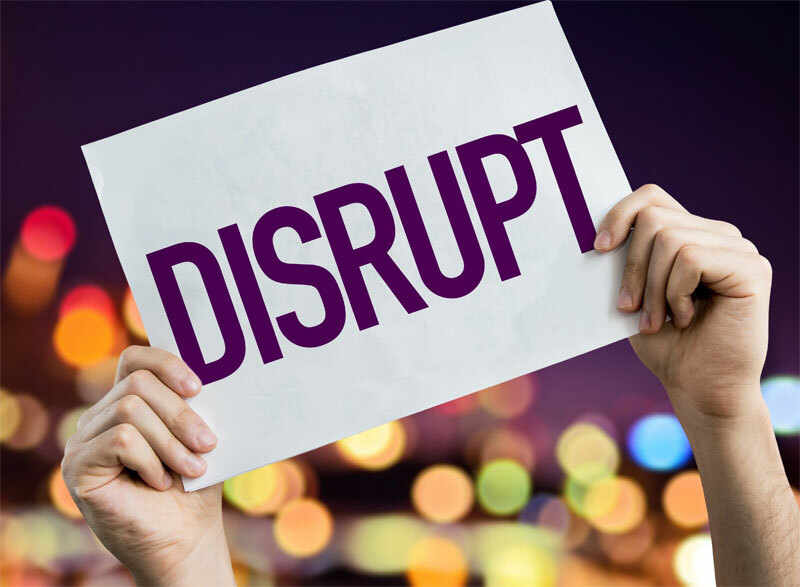 To manage digital disruption, however, approaches are needed that are comparable to the management of disruptive innovation. In addition, it makes sense to shift innovation activities to online platforms in order to be able to use the creative potential of employees from different locations, customers and experts. Innovation methods such as open innovation, co-creation and crowdsourcing have proven to be effective in managing Digital Disruption.